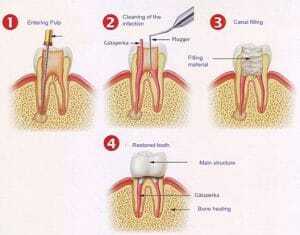 Each stage of the Root Canal Therapy requires a separate appointment for each. We understand that this may be an inconvenience for many patients and the dentist will work closely with you to ensure your appointments best suit your needs. The complexity of the treatment plays a large role in the cost of the treatment. At Sydney Dental Crowns we aim to provide exceptional dental work at an affordable cost. Patients can expect to pay approximately $800-$1,200 for Root Canal Therapy. Going to Sydney Dental Crowns from St. Vincent's Private Hospital takes around 7 minutes to drive. Head south on Victoria St toward Oxford St and turn right at the 1st cross street onto Oxford St then another right at Whitlam Square onto College St. Turn left onto Park St and and go left onto Hunter St then lastly, left onto Pitt St where you'll be able to locate us on the left.